When it comes to natural and cultural attractions, Ecuador is one of the top countries in South America! First of all, we have a country nestled in the Andes cordillera in the northern part of South America that received its name from the equator line. Hence, visitors can enjoy snow-capped volcanoes as part of the scenery together with warm weather, year round. Furthermore, we are talking about a country with relative small size, often compared to the size of Colorado in the U.S. This feature of the country, allows you to visit 4 very diverse regions each with different geography in just a couple of weeks. So, regardless of the amount of days you decide to visit Ecuador, it is a good idea to consider all the options available. Plan ahead in order to enjoy the best that this country has to offer. 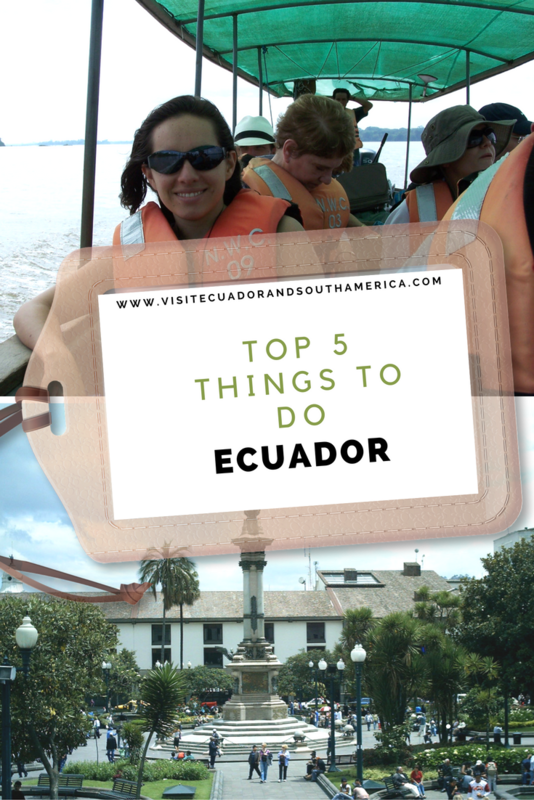 Therefore I have made this list to help you plan, it has the top 5 things to do in Ecuador. Your trip to this South American country should include a visit to its cosmopolitan, vibrant capital city, Quito. Main reason to visit my city? To visit the picturesque colonial center of the Old Town, declared first world heritage site by UNESCO in 1979. 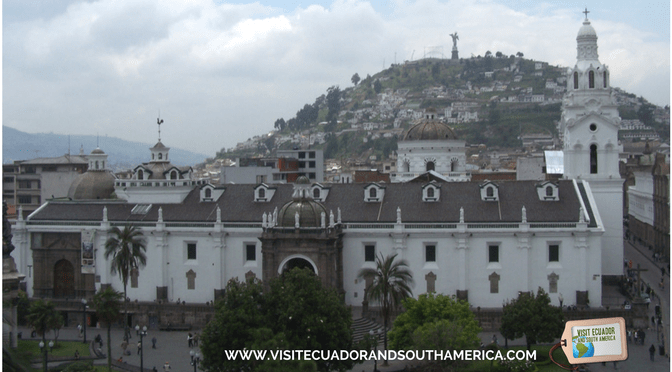 There are also, other reasons to visit Quito. Two hours North from Quito you find one of South America´s biggest open-air markets, Otavalo. The market that dates back to pre-Inca times is the one of the highlights of the visit. 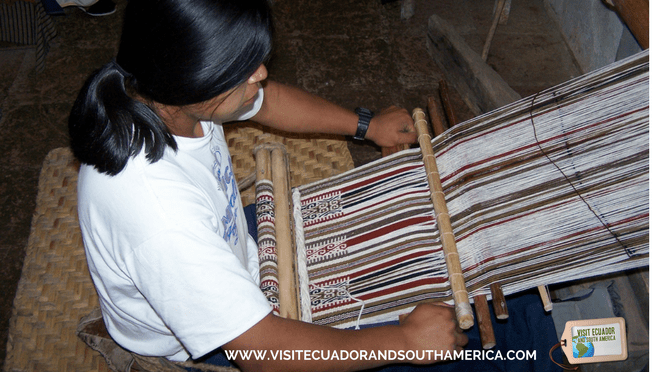 You will meet one of the 14 indigenous groups of this diverse country and their beautiful handmade crafts that delight visitors from all over the world. Find out how to get there, places to stay and activities in Otavalo. 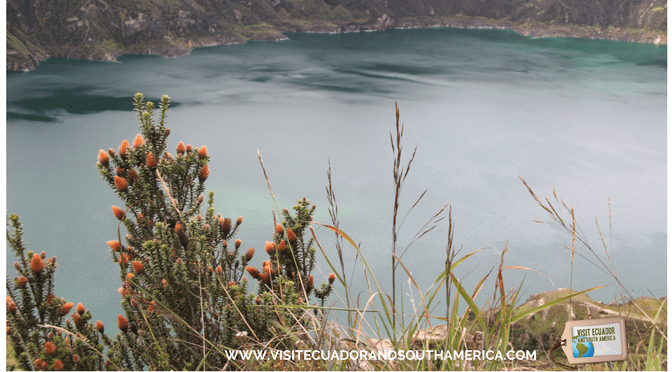 One of the top adventures in Ecuador is the spellbinding crater lake of Laguna Quilotoa. This is one of the top hikes in the country, surrounded with magnificent views and traditional Andean villages. Find out how to get there, what to bring and many other useful information for your visit to Quilotoa. Definitely one of the most exciting destinations in the country! El Oriente as we call it in Ecuador has a plethora of activities to offer. During your visit you can take a canoe to spot some of the diversity of the Amazonas river. 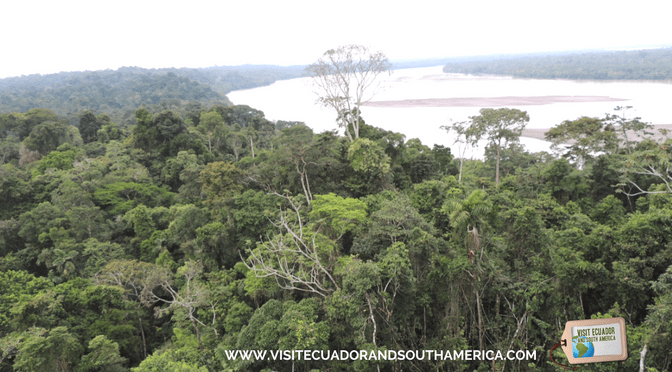 Furthermore, take time to climb an observation tower to enjoy the rainforest canopy. Another great activity is a trek to spot rainforest flora and fauna of all sizes and, if you’re lucky, spot a caiman resting on the side of the river. Want more inspiration? Find tips and reasons to visit the Amazon Rainforest. The islands that inspired Charles Darwin in 1535 offer a unique experience and if you can, you should add them to the list of places to visit in Ecuador. 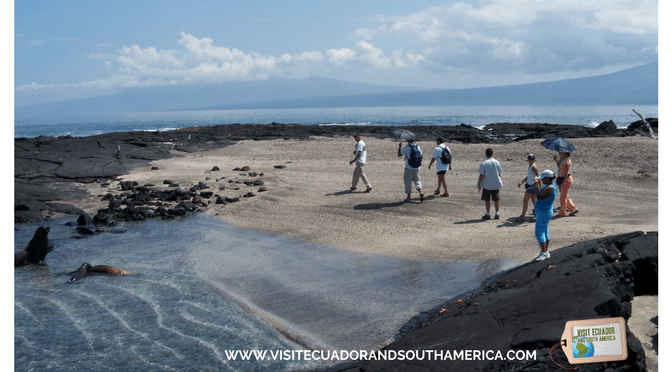 This archipelago of lava formations offers a wide range of activities and attractions to visit. Furthermore, there are different ways to enjoy the Galapagos Islands depending on time and budget. You can book a cruise or choose a land option and enjoy them on a budget. In addition, you can find out how to get there, where to stay, reasons to book a cruise and how to enjoy the islands on low-budget. In conclusion, Ecuador in a small area of 283.000 sq. kn 6 approximately 15 million inhabitants has a plethora of activities to choose from. I here give you what I consider are the top 5 things to do in the country. Booking here any or all of these tours easily here and save time avoid the stress of planning and more. Are there any other places I should add? Tell me about it. It is a great place for souvenir shopping! So cool! I wanna go there so badly it looks so fun and obviously so much things to see! The Amazon rainforest looks beyond!! Yes, and the best thing is that you can visit most of these places in a couple of weeks due to the short distances in the country! Yes Sharon, There are many things to see. You will love it! I would love to visit the Galapagos and dive there. I always seem to forget about it and seems really expensive. Are you aware of DIY options to save money? Some great reasons why to visit. I think I’d pick exploring the Amazon Rainforest if I could only choose one. Thanks for sharing. The Galápagos Islands yes! Planning a trip in a few years after retirement! Ecuador will be amazing can’t wait to see the rain forest and hoping to find a zip line! I’ve always wanted to go to South America. Amazon Rain forest and Galapagos would be my choice. I’d love to visit Ecuador! didn’t realise the name came from the Equator Line or that the Amazon passes through its borders. A Galapagos cruise has been on my wish list for ages and now I realise there is more to Ecuador than the Galapagos. Would love to go to South America. Exploring the Amazon rainforest is definitely on the bucket list! Thanks for breaking it down for me. The only part I really ever hear about Ecuador is Quito (only because it is the spot to head over to Galapagos). I hope to explore parts of South America in 2017 and Ecuador is mid way up our list. Great post and can’t wait to hit ecuador one day 🙂 love the photos. Though we never met during my 3-month trip in Ecuador 2 years ago, I’ve done all of this and had a very great time! Ecuador is one of the places where I truly felt what it’s like to be alive. It’s been a while since I visited this blog but I am really happy you are still doing great in everything that you do!